I absolutely love the demo and I'm so excited for the complete version! I have a question, it is mentioned that there will be a free and paid version of the full game, what would the difference be between them? Thank you for creating this wonderful universe! Hello, Anna~H 20b! I'll be happy to help. Let's see...what kind of laptop do you have? Mac, PC, or Linux? As for Tate no Yuusha no Nariagari, I haven't read it yet, but after giving the summary a look, the story does look intriguing! Does it happen to be a series you like or does the game's premise remind you of it? I'm using PC Windows 7, also I was just asking a random question perchance that you might also be a fan of this series; a series not just known to be likeable but also a frustratingly and satisfyingly engaging reading experience plus you most likely won't get bored since its not a novel but a "manga". So excited to be able to purchase the full game. Hi, xoxdqxox! We're all working hard, so we're thrilled to hear it. If you have any questions, just let us know. You can also talk to us on tumblr, where we post updates periodically. We appreciate you taking the time to comment. It motivates us to keep doing our best for everyone! Have an amazing weekend. I really like your game plz complete it quickly! I can't wait anymore! Hello, Goldshade! We're really loving your enthusiasm. We can't wait to finish it, too! I can't say for sure when that will be since we want to make everything awesome, but if it helps...we do post some fun stuff related to Beauty and the War (X Playing Pieces) on our tumblr like this. Feel free to look around our tumblr and ask questions, if you'd like! It might help with the wait. If you have any questions, feel free to ask away. Have a wonderful rest of the day! I've been notified that you updated the game as I'm following you, and I'd like to know the changes from the previous demo. Since I've already played a couple of times, I'd rather know if I should play this version too, or wait for the next one! Thank you, and congrats on the progress! So, the main thing is that Ambrosia's voice actress re-did her lines according to the feedback and our direction. It'll undergo some more polishing in the final version! (She's very determined to nail the delivery.) If you'd like to give it a listen and let us know what you think of her hard work-in-progress, we'd love that. Feedback's always helpful! Otherwise, please feel free to wait for the full version, which is the end goal we're all pushing for. Hopefully, it'll be sooner than later! No problem! We'll be looking forward to it. Oh, by the way, we posted an update on tumblr a while back, explaining a little bit about the kind of voice Ambrosia is meant to have. Feel free to check it out if you have the time! We post a lot of fun stuff on tumblr. After playing War 13th Day, and War: Valentine, I am so happy there is another game set in this universe! I LOVED playing those two games and I have enjoyed playing the current demo version of this game (I will be purchasing the paid version just as soon as it is available!!). I love the addition of X and the new prison location, and how the story goes back and forth between the past and present. Having the games voiced is really great, although, I find the VA for Ambrosia to be... distracting... the accent and pronunciation of certain words sounds as if the character has a speech impediment of some kind, instead of sounding, uhm, I assume, exotic..? Also, is it me, or has the look of Chase changed from the other games? The look of him seems different- not as cute looking, but a little more rougher in appearance. Regardless of the few minor things I found less than pleasing, I truly loved the game and cannot wait for the finished product!! Kudos to all involved in making such an enjoyable game. Hi, DAGamerGal! We're delighted to hear you've been enjoying the X Playing Pieces universe. Aha, yes, Ambrosia is meant to speak with a hint of an exotic accent. We believe she was trying to give some words an English slant and others an oriental touch, which didn't seem to work out so well for you! However, we'll see if she can't adjust her accent. After all, practice makes perfect. We'll probably post some audio clips over on tumblr to get feedback in the future. The team and I listen to the dialogue so many times that fresh ears are helpful! We fully believe our voice actors can do it with hard work and support. As for Chase's appearance? His design is relatively the same (aside from the addition of his fur coat), but his leathery skin texture is being made a little more prominent. Let's see...this short piece should explain why a little better. (Long story short - his rougher appearance is part of his character. He's generally not known for being attractive on Virgo Island.) Though, we do plan to touch up his design for the full version to make sure the art's all on the same page. Thanks for letting us know what you think, and we're thrilled you're looking forward to the full version! (We are, too.) If you have any more questions/feedback/theories, feel free to let us know. Have a Happy New Year, DAGamerGal! Thank you so much for your response. I hesitated in saying anything in regards to the voice for Ambrosia, as I did not want to come across as harsh or overly critical of the VA. I have the utmost respect for the amazing people that do VA in video games and anime, and understand that it is not an easy job to do. Really, if you as the developers are happy with the character's accent, then that is all that matters! As to Chase's updated appearance, it makes sense that his looks would change to suit the new style of graphics used in the game. Hi, Sandpixie! This is the same game. This is a demo beta (version 2) - a work in progress, so it's still going through polishing and touch-ups. However, it is indeed the same game! Just think of this as an upgraded version of the last demo (version 1). The story should be easier to follow, the gameplay better explained, and the art updated. Plus, you'll get introduced to the character of X. If you have any other questions or comments, just let us know. Have a Happy New Year, Sandpixie! oh ooohhh so it's where we left off? Ah, so much to cover.. I like it. So far. Most of it anyway. The music was lovely, and it carried the game well through the different settings and tensions. The ending credits seem so upbeat and techno it clashes with the game, kind of like the "Bleeding out" or "shot" endings from Don't take this risk (which actually made me mad because I was genuinely upset with the ending, then to be greeted with blaring techno music straight out of a rave was just..). Ahem. I'll leave that rant for another day. The art, goodness I loved the art, of course not everythings perfect but goodness some of those scenes were straight out of a triple A production level good! Forgive me I'm gushing ^^; But really honestly the scenes from the "prison" are the best so far, the art is just incredible. What did I like the best... hmm.. Honestly Viktor and Chase are still my favorites even with Arseniks new artstyle. Even though nothings really changed for them I still like them best. Hi, Artemis-Ameretsu. Ooh, thanks for playing the demo and letting us know your thoughts! I'm glad to hear you enjoyed the music! Aha, but it seems I have a habit of putting in an upbeat credit song. I'll have to see what I can do about that for the full version. Speaking of which, I took what you and others said into account and did some more tinkering with Ambrosia's sprite recently! Better or worse? Rest assured, I'll be tinkering with the art for a while before I'm fully satisfied with it! But it's always helpful to get a second opinion. When I'm working on something, I'm often staring at it for hours, so in a way, my eyes get used to seeing it. As for the art update I think the sprite art does look a bit better. I say a bit because I couldn't honestly remember what I disliked about the original ^^; I just have a vague recollection of it weirding me out..? Either way it looks good ^^ any improvements you've made definitely made a difference. She still seems young but I think I'll acclimatize to it once the game comes out if it hasn't had any major updates by then. Aah, I've played the first version of the demo, and now I'm back for more! I've filled the survey, which explains some of my opinions and gives plenty of feedback, but I still want to comment here too, so you'll be able to answer if you want and to overall tell what I didn't tell in the survey and repeat some things. I must start with this: I was very worried when I saw this new version in my Feed inbox and while checking the newest visual novels. I tend to dislike what I see as major changes, and the addition of X is a pretty major change. Now, I understand he was planned from the very beginning - I've checked out the extras at the end of the demo - but from a player's point of view, he's still all novelty. And well, it's the character you see on the game's thumbnail now, so I was pretty much "Wait, what? Who IS this guy?! Ugh, what the hell, I don't want this guy to be here...". Buuut... it happened that he's pretty much my favorite type of character, or one of my favorite types at least, so I fell in love pretty quickly. I may be a huuuge Viktor fan, and I always wanted him to be the last hidden romance, but now I honestly don't know because I like X at least as much as him and I'd loooove to see how a romance with him would be. I've explained that a bit more in the survey. I also really love the new version of the prologue. The old one was interesting, but well, the things with X and his point of view, and his meeting with Ambrosia and all... it's pretty great! Now, unfortunately I can't be as happy about the other major change - the art. I don't mind Arsenik, and I think Ambrosia in the "present day" looks pretty great, but man how do I dislike her sprite in the Virgo Island part - and well, it's a huge problem since it's the major part of the game... I used to think she was so very pretty, and her prison parts sprite still indicate that, but n my opinion she doesn't even look like herself anymore in the Virgo parts. And she doesn't look like the other characters either - her sprite style clash pretty much with everything else. What bothers me the most are her eyes, so small and semi realistic compared to the other characters'. I don't think it really suits the story and overall art direction of the game, and while the drawing itself may be more "mastered" than before, I'll take the old sprite anytime over this one. With that out of the way, I'll be answering the Lemmasoft questions. Only the second set, since the "before playing" one would be the same as before, of course. 1❀ What were your expectations going into the game? 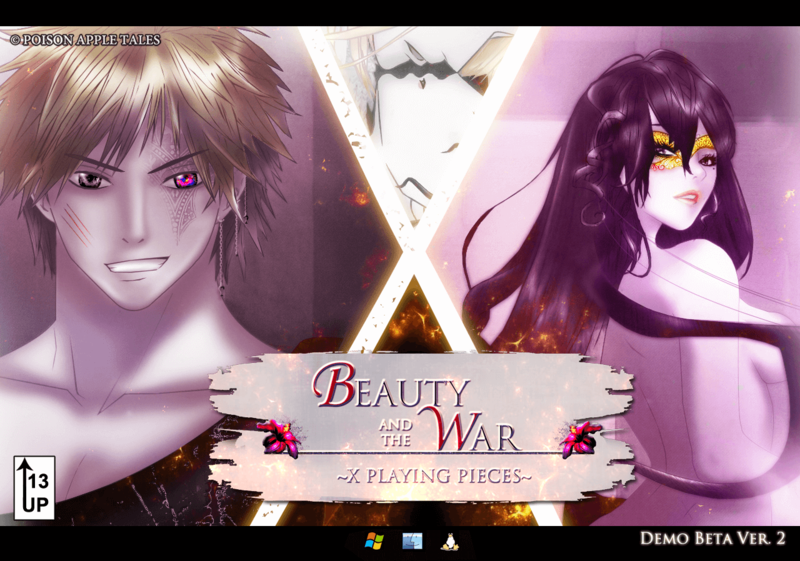 And how did Beauty and the War (X Playing Pieces) meet or contradict them? Well, nothing new here - I was mostly intrigued and the game fulfilled my expectations and made me even more curious. A for this particular version of the demo, what I said before answers it pretty well. 2✿ Tell me. How did you spend your two days? There are a lot of choices, so I'm curious what you decided to do and who you tried to befriend. I did the same as on my first playthrough of the previous version of the demo. I've tried to do all the chores, and spend half of the time going to the woods, and half tending to the wounded. I've tried to befriend mainly Viktor and Chase, and started the romance with the latter. 3❀ What are your thoughts on the story and the characters now? Do you have a favorite? What were you feeling during the last scene at the end of the demo? My favorite (revealed) bachelor is Chase, and my favorite characters overall are Viktor and now X - can't even tell which one I like the most. I really don't know what to think anymore - I still want to see Viktor as a romance option so badly, but X would be so great too... I'm so conflicted because I know any of them would make me so happy, but also so sad that the other one wouldn't be an option. Now, when you say final scene, do you mean the very end of the story itself, or the bonus scene about X's toughts on Ambrosia? Since my answer wouldn't change about the former, I'll answer about the latter. I've already said that in the survey, but that bonus scene is my favorite part of the game now. I think it's so beautiful in so many ways that it really touches me to the core and makes me want to cry. It's amazing! 4✿ What are you looking forward to seeing in the full version? Haha, well, more of everything haha! And also, I'm curious about the guy from Don't take that risk! My mind was kinda blown when I've learnt that he REALLY is part of the story. Even if it's a minor role, the fact that the two games actually take place in the same world is kinda incredible to me, to be honest. So yeah, pretty excited about that. I'm also curious about the r-16 content of the paid version (I'll be getting that one) and I'm wondering who'll be an eligible bachelor exclusively in that version. I'd also love some twitches to the voice acting, but I've said more about that in the survey so no need to repeat it here. Anyway, whatever happens, good luck with the project! I can't wait to play the full version! Hi, Konoi! Ooh, it's great to hear from you again. (I remember when you commented last time for the first demo! It was both helpful and encouraging, no doubt.) Thanks for filling out the survey, too! As promised, every single word was read. For the scene where X sees Ambrosia's back, I was trying to make it so that her hand's on her stomach, but I can see that didn't go over so well! I'll have to put that fix-up on my to-do list. As for Ambrosia's Virgo Island sprite, you could say it was...almost an experiment? I wanted to show how Ambrosia would look "in the real world" so to speak, while maintaining an anime aesthetic. So far, people are having different reactions to it. Either way, I'll definitely take what you said into consideration! Again, thanks for answering the survey and for commenting here, too. Merry Christmas, Konoi! Oh, by the way...since you saw the bonus scenes, I'm curious. When Ambrosia lands on X in the beginning - as you might recall - do you think what happened there was A) On purpose, B) An accident or C) Something else (feel free to elaborate!)? Now you made me really curious about that oh so difficult to handle bachelor haha! As for Ambrosia's hand on the shower CG, I figured what you meant to do with it, since it wouldn't be logical to just cut off the hand, but it looks like that. Maybe if you added a little bit of her knuckle on the other side of the hair or something it would look better. On X's thoughts matter, well, honestly it's a risky bet. I mean, changing the point of view. In some games it goes well, in others not so much. I'm always a bit wary of that, but I think it's nice that the past is from Ambrosia's point of view and the present from X. Makes a nice separation. And well, X is really great - I love the writing on his parts and the stiking contrast with Ambrosia's parts. Not to mention it adds so much mystery to the present part, about Ambrosia's story (though I'll tell more about it when I answer your question, since it's related). Oh yeah, I forgot to tell about that before, but X's notes are a great addition too. They're not only helpful, but also add more insight into X's character, since you have less story time from his point of view. I also really like all of his interruptions or how Ambrosia offers to "translate" the more refined ways of speech to him. I like how it can help some players AND it's genuinely charming in it's own way. But aah, I can't even stop thinking about that bonus scene by the end of the game. Sometimes you see that ONE scene in a game, series or whatever that'll stick with you forever, and it was one of those for me. If only because of that bonus, I'd like X to be a romance option haha! Since you mentionned it, I actually do have a question - I came up with it seeing how you were telling me you're glad I was interested in the r-16 version and it's exclusive bachelor(s). Does it actually mean that version will have more than the 7 bachelors advertised here and there? If that's the case, I wouldn't have to abandon hope yet for Viktor AND X haha. Aaanyway. My answer would be, AGAIN (since I did it a lot in the survey haha) - C: something else. You see, since present day Ambrosia acts on her own, BUT the players can have a major influence on her as a person in the past, I think that all the events in the prison - both the things she does and the things she says to X - may be accidental or on purpose, true or false, depending on the playthrough. Basically, I think if you play her as a manipulative temptress and things like that, then by the end of the game you'd discover the event of the meeting with X was on purpose and that she lied about lots of things. And in a similar fashion, if you play her as an innocent and honnest pacifist, then the event would have been on accident and she'd tell the truth in her story. Basically, my bet is that the way you make her act in the past shape the very reality of the present. Hmm...well, the good news is that as the years pass and Ambrosia grows older, her sprite will change! I've also adjusted her sprite recently, and I'll probably continue to work on the art until it feels right. To answer your question...yes! There will be more than 7 bachelors in the r-16 version. Thanks for letting me know what you think as always. I hope you have a Happy New Year, Konoi! Thank you for answering my question! Since I'll be buying that version, I'm pretty excited about it! And also, I've checked the link you sent me, and the new sprite for Ambrosia is so much prettier in my opinion! While I'm still not very fond of semi-realistic styles overall, I don't think she clashes with the other sprites anymore - I'll redownload in order to have the newest version, but even without playing it I can see it won't bother me anymore, so that's good. Hi, Sandpixie! Yes, the paid version will be rated 16+ and will include steamier romance scenes (all optional, of course). Plus, more animations, more choices, more endings - more everything...including the love interest(s). OMG!!! I'm so excited to play this. I know it's gonna be good! Aww, thanks, cheoories! We're thrilled to hear that you're excited for it. Feel free to let us know what you think after playing it! Have a very Merry Christmas, cheoories! Hi, Pixel! Glad to hear you're checking out demo ver. 2. There's also a survey in-game, which you can answer anonymously. However, if you rather comment here with your thoughts, that's perfectly acceptable as well! I'm just laying out all the options. The team can handle constructive feedback, and as long as your heart's in the right place, then we won't be upset. In fact, we'll thank you for helping us to achieve our full potential! I believe in the Poison Apple Tales team, and I hope you can, too. Thanks again for playing the demo, and I hope you enjoy the rest of it! We'll definitely let her know to touch up the accent, so that it's not giving off Elmer Fudd vibes. Of course, if the changes still come off as unappealing, there is actually an option to mute the voices in the Preferences screen. This way, you'll be able to enjoy the story without worrying about it. I hope you have a Happy New Year, Pixel!